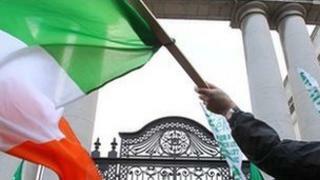 The Irish government has unveiled the toughest budget in its history which includes 6bn euros (£5bn; $8bn) of cuts. It includes further details of tax rises and spending cuts in addition to those outlined last month when it launchd its four-year National Recovery Plan. They are designed to sharply cut the country's huge budget deficit, which is a requirement of the EU and IMF bail-out. no reduction in state pension. Despite pressure from other eurozone members to raise its corporation tax of 12.5%, Dublin said the rate would be held. The Irish Government maintains that a low rate of corporation tax is a cornerstone of its industrial policy and part of Ireland's international brand. There will also be an exemption to corporation tax for new companies. The government in November said a planned 2.8bn euros saving in welfare expenditure by 2014 would return it to 2007 levels. It said it was needed because working-age social welfare rates were now more than twice their rate in 2000. "The substantial reductions in tax and increases in welfare were made possible by the very high level of property-related tax receipts taken in by the Exchequer during the boom years," it said. "The state can no longer afford this," said Finance Minister Brian Lenihan on Tuesday. There will be a 10 euro per month reduction in child benefit rates. This means, for example, that the benefit for the first child will be cut to 140 euros from 150 euros. However there will be no reduction in the state pension this year. "We have significantly increased the State Pension over the last ten years and it is the government's view that the security this has brought to older people should be preserved" said Mr Lenihan. One piece of good news was the announcement of an additional 40 euros payment to households in receipt of the winter fuel allowance because of the recent harsh weather. VAT will rise from 21% to 23% by 2014, raising 620m euros a year. "VAT rates have increased across Europe in response to the current crisis with some 23 member states now having rates of 19% or more," the Irish government said. It will also look at imposing VAT on more types of goods. Dublin plans a "fundamental" reform of the income tax system because it says more than 45% of people are exempt from it. The government wants to bring more people into the tax net by lowering thresholds, with the bulk of the money to be raised under the recovery plan falling in the 2011 tax year. The budget also detailed plans to abolish or restrict many tax reliefs that higher earners use to shelter income from tax. The top marginal rate of tax will be kept at 52%. The Republic's National Recovery Plan included another striking feature - a cut in the value of public sector pensions already in payment. At 2.8bn euros a year, these account for nearly 15% of the total public service pay and pension bill. The Irish government plans to cut that by 4% by reducing pensions - knocking 100 million euro a year off this cost. There were nearly 124,000 public sector retirees in 2009. They will see their pensions cut in 2011. Those who retire after 2012 are going to have their pay cut by 7% which will cut their pensions and retirement lump-sums anyway. In addition to these measures already announced the government has revealed that pay for senior government ministers is to be further cut. "The salary of the Taoiseach will be reduced by over 14,000euros per annum and the salary of Ministers will be reduced by over 10,000 euros per annum," said the Finance Minister Lenihan. Furthermore the government is putting a cap on public sector pay at 250,000 euros (£210,000; $333,000). The minimum wage is to be cut by one euro to 7.65 euros per hour. The government said a cut was essential because the existing rate was "out of step with an economy where GNP has fallen by 19%". "Other labour market regulations are preventing job creation - especially in sectors where unemployment among younger and less-skilled workers is most prevalent. Decisive reform is required." Like the UK, the Republic is hoping that its planned 24,750 reduction in public sector jobs will be more than made up by job creation in the private sector. The total pay bill for public sector workers will fall by 1.2bn euros by 2014. Dublin said that labour market reforms were expected to create 150,000 direct and 150,000 indirect jobs over the next few years. "We have also set ambitious targets for new foreign direct investments, tourist numbers and exports," the government said.